Generally, a person must have a written admission contract before being admitted to a nursing home. The nursing home may call its contract a “residency agreement,” an “admissions contract,” or other similar term. Nursing home contracts are complex. A nursing home may use the two model contracts pre-approved by the Department of Health & Mental Hygiene (DHMH) or may use its own contract. The two model contracts are: (1) the basic “Resident Admission Contract” and (2) the “Resident’s Agent Financial Agreement.” Generally, the Resident Admission Contract is used. If the person being admitted to the nursing home is not mentally capable of entering into a contract, or has asked his or her agent to sign the contract, then the Resident’s Agent Financial Agreement may be used. If you know someone planning to enter a nursing home, get copies of the model contracts from the DHMH Office of Health Care Quality or your local Long-Term Care Ombudsman. Compare the language in the contract of the nursing home against the model contract. If the nursing home contract is different from the model, ask the nursing home or Long-Term Care Ombudsman to explain why. Beware of a contract that differs a lot from the model. It could include unfavorable or even illegal terms. If the nursing home you are considering does not use the model contract, ask if it will use the model contract for you. If the nursing home will not agree use the model contract, then add to the nursing home contract, the language from the model contracts that provides protection to residents. If the nursing home will not do that, you might want to consider another nursing home. It is a good idea always to discuss questions about contracts with the local Long-Term Care Ombudsman, a lawyer, or other trusted advisor. Get the answers before signing. What terms must a contract include? Nursing home contracts must contain certain provisions to protect consumers. Extra fees may be charged for services not included in the basic rate. Rates and fees may not be increased without at least 45 days written notice. The contract must state the reasons why rates and fees could increase. The contract must also provide information about late fees. Medicare and Medicaid. The contract should explain how to apply for both Medicare and Medical Assistance (Medicaid). If the home accepts Medicaid, it cannot discriminate against you because Medicaid is paying for your care. It is also illegal for a nursing home to require you to pay privately for a period before the nursing home will accept Medicaid on your behalf. A deposit cannot be required if you are being admitted from a hospital under Medicare coverage. The contract must also explain your right: (1) to challenge the nursing home if it wishes to discharge you (including your appeal rights), (2) to have an advance directive, (3) to keep personal property, and (4) to have your property be safe. How to complain. The grievance or complaint policy of the nursing home must be clear and explain how to make complaints to one or more of the following: anyone working at the nursing home, the Long-Term Care Ombudsman, or the Department of Health and Mental Hygiene. The nursing home and state agencies have a duty to investigate complaints and attempt to solve them. It is illegal for anyone at the nursing home to retaliate against someone for making a complaint. Bed-hold policy. This explains how and when you can return to the nursing home after a hospital stay. The policy must be included in the contract. The nursing home also must give you a copy of the policy when you are admitted and when you go to a hospital. Even if Medicaid or Medicare is paying for your stay in a nursing home, the home can charge you personally to hold your bed while you are in a hospital. If you do not pay, you may not be able to return to your room when you are discharged from the hospital. Regardless of whether you pay the bed-hold charge, if you are on Medicaid, you have a right to return to the first available bed at the nursing home. There should be no blank spaces in a contract when it is signed. If someone from the nursing home says that a section “does not apply,” mark the section “N/A” or “not applicable.” Every person signing the contract should initial and date each handwritten change or addition to the contract. If different parts of the contract seem to contradict each other, demand that they be changed. Better yet, ask the nursing home to use one of the State of Maryland model contracts. Ask for help before you sign. The Long-term Care Ombudsman program or an attorney can help you understand the contract. Get a copy of the contract and all exhibits, attachments, etc., after the contract has been filled out and signed by both parties. Remember your right to negotiate. Any contract can be modified before you sign. Every person has her or his own needs-make sure the contract addresses yours. Broad statements that the nursing home is not responsible for any injuries or loss of property. Never agree to waive liability for injury, illness, or loss of property that is the fault of the nursing home. A nursing home may request you to sign an arbitration agreement. An arbitration agreement requires that an arbitrator, not a judge or jury, decide any dispute that arises between you and the nursing home. Generally, it is not to your advantage to sign such an agreement before a dispute has arisen. Unless the resident is not competent to sign a contract, no one else should be asked to sign the contract. 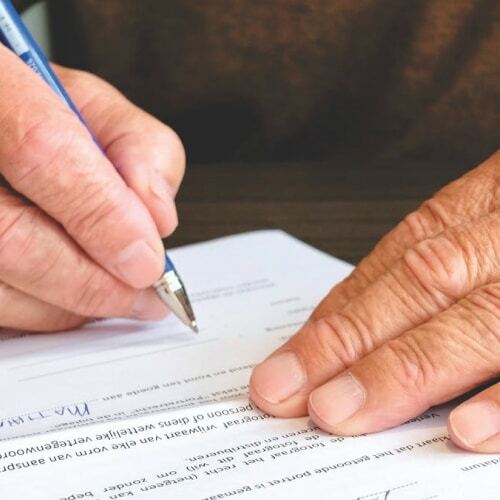 A nursing home may require another person to sign the contract only when: (1) the resident has a guardian or (2) her or his doctor certifies that the resident is incapable of signing. If another person is signing, the contract should clearly list the duties of the person who signs. Unless the other person (such as a family member) voluntarily agrees to be personally liable, the contract should state that: (1) the resident and the other person are only required to pay from the money and assets of the resident, and (2) the other person is not required to use his or her own funds to pay nursing home bills. Maryland Long-Term Care Ombudsman – (410) 767-1100. DHMH Office of Health Care Quality – 410-402-8201. Lawyers – Call your local area agency on aging for help finding a lawyer, or call the Maryland Senior Legal Helpline at 800-367-7563 to obtain free legal advice if you cannot afford a lawyer. Questions and Answers on Medical Assistance for Nursing Home Care is a good summary of this complex topic and is available on the internet at http://www.peoples-law.org/node/1004. The Elder Law Section and the Public Awareness Committee of the Maryland State Bar Association have prepared this information. It is intended to inform the public and not serve as legal advice. Nursing Home Admission Contracts in Maryland © 1986, MSBA, Inc. Revised 1998 & 2012.